Last winter while visiting Urban Outfitters, Avalon and I were both smitten with a fabulous rhinestone accented cat ear headband. Avalon liked it so much, she wanted to make one for herself. We put our heads together to devise a way to make one using black felt, Tulip Glam-it-up crystals in black and a store bought headband. A thick craft wire to give it some stiffness and some Aleene's Fashion adhesives helped to bring it all together. Step One: Decide what size you want your ears to be. Each side of our ears is 2" and when wrapped around headband from center to tip they measure 1.5". Since they fold over, you need to cut a diamond shape that when folded makes your finished ear. Don't cut the center out yet! Step Two: Place cut felt on Fabric Fusion Peel and Stick sheet. Cut it out, leaving backing on. Step Three: Cut the center out of your ears carefully. (The cut out edge needs to be thick enough to accommodate your wire and crystals so measure twice and cut once.) Cut a piece of wire to fit one side of your ear (it needs to be just a little shorter than 4"), bend at the center point using chain nose pliers to get a sharp bend. Remove backing from one side of your shape. Carefully place wire into adhesive. Step Four: Decide where you want to place your ears on the headband. Gently place the center of your ear on the band. Remove the rest of the backing. Fold two sides over, working from bottom to top carefully so all adhesive is covered. Step Five: Since this felt is acrylic, heating it with a tool might cause it to melt, so instead we used Aleene's Fabric Fusion to attach the crystals to the ears. Purrfection! 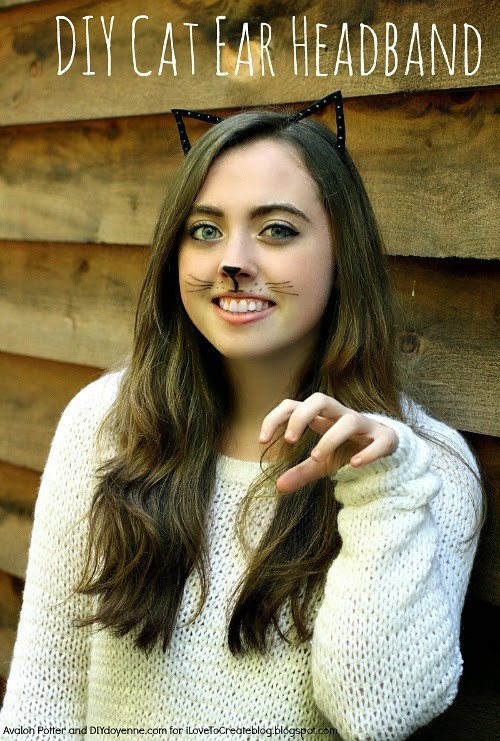 You'll be the cat's meow in this purrty headband! 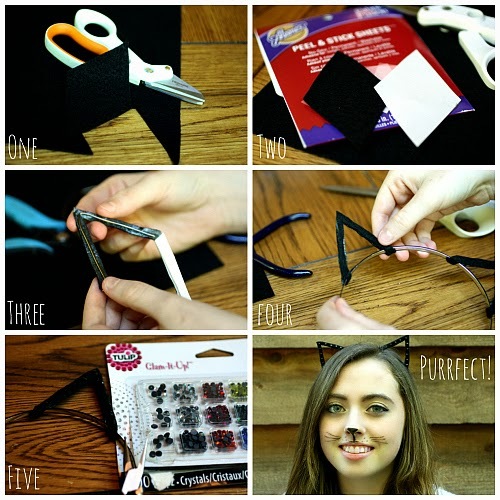 Use Tulip Body Art Color Sticks to add a nose and whiskers, clip on a tail and...Halloween Cat Costume...done! 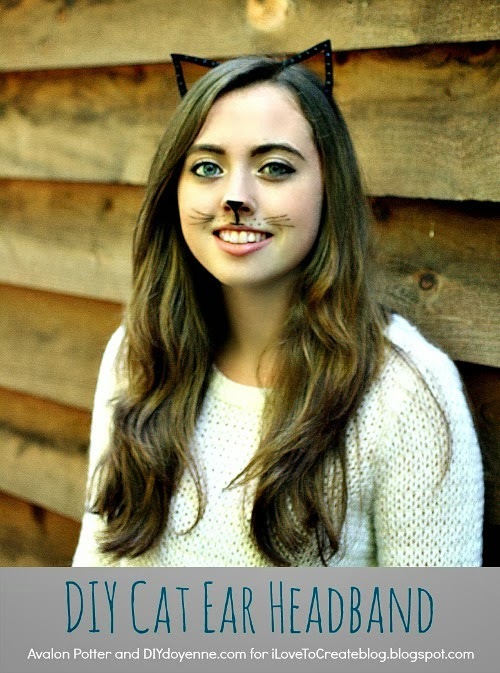 Visit our Facebook page for more DIY inspiration and visit Avalon and me at DIY Doyenne for your daily dose of DIY! Loved the headband! Your so sweet, I would copy the idea on my class costume party. Cat ear is so cute. Love the pattern. Gonna give it a go. 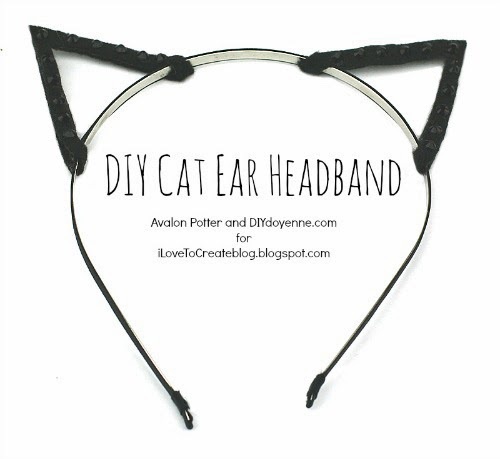 Thanks for sharing this headband DIY tutorial.